Multi Cultural voice of Canberra – expressing disquiet and even fear about the tone of the current Team Australia conversation. Some Muslim women too scared to go out – others giving up the Hijab for fear of attack. Log Jam – ecologists acting like beavers to save the Murrumbidgee. Garage Baker – fine pastry cook and cake maker operating out of his suburban Dickson garage. Haptic art – an exhibition at Tuggeranong Arts Centre. 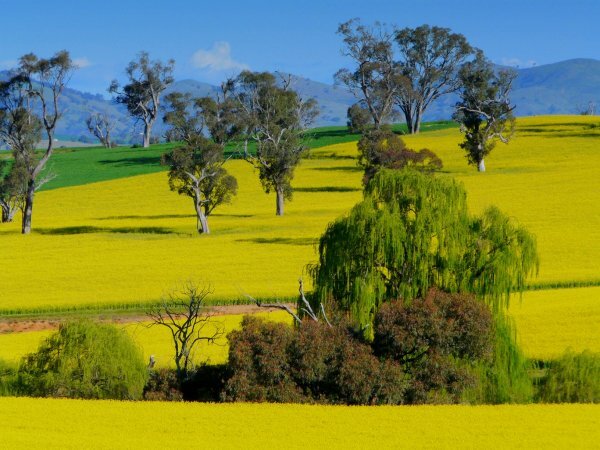 Photo is by Damian Porombka (Canola fields near Harden). Regarding 1. Isn’t this like letting a fear of trolls stopping me from crossing bridges? Since 9/11, how many Muslims have been killed in hate crimes by Australians? Compare this number to how many Australians have been killed by Muslim Terrorists. Reality check! How about you give us the numbers regarding who has killed whom then. To start with, 92 Australians killed in 2 Bali bombings, couldn’t find any Muslim hate crime murders. ” You have raised a good point concerning the misuse of registered names, particularly buy governments. The IP Australia ATMOSS database reveals that there several registrations of the name “Team Australia”. The Australian Olympic Committee has all except one. The lone one is the one you have referred to (owned by DMO) and it has also a registered trademark. It would be hard to argue misuse when the campaign has been used, by the PM, to launch a foreign war and increase security spending. Must just be coincidence. A patent lawyer may think differently but I am sure by now DMO have given consent for the PM to use the phrase. Why did your wife feel impelled to cover her head in the first place though? the fact that this oppression appeared to be “loosely applied” doesn’t make it OK for Australian women to be pressured to cover their heads. Anywhere. I guess she did it for the same reason that people many wear motorcycle helmets when riding motorcycles in Australia. I’m sure, if given the option many people would prefer not to. But they don’t have that choice. It is the law. Same with smoking at bus stops in Canberra, or walking around with guns on their belts, or being forced to provide ID when getting a mobile phone, or the prohibition on owning a pet cheetah, or walking around naked, or parking where you like for free, or using fireworks, or taking cannabis for pain relief, or being compelled to vote, or being forced to take part in a census, or refusing to allow gays to marry. Many people in many parts of the world would consider many of those laws oppressive. By the way. I didn’t feel oppressed in Iran because it was illegal for me to walk down the street without a shirt on. Something I take for granted as a right in Australia (that I never exercise except perhaps at a beach). Australians should obey the law wherever they are. There are ways and means to effect change of laws both here and overseas. Arbitrarily breaking those laws is not one of those methods. It’s past time the meaning of “Australian” was clarified. We now have a group of people who have their own (unelected) Australian leader and “the law” to them is not what is to most Australians who were born here. Just when we thought it was safe to go in the water, he’s back! I missed last night’s 7.30 and it is not yet available to watch on the computer. I have heard reports on ABC 666 Radio this morning that a Muslim woman had been interviewed and she said she had stopped wearing her hijab in Canberra because of fears of attack etc. Has she reported these abuses and threats to the authorities? I am unaware where this lady comes from but if she was to return to her country of origin she would be immediately told to put her hijab back on, as would any other Western woman visiting most Muslim countries. The point I am making is that in Australia, the woman has a choice whereas in most Muslim countries she doesn’t have any rights let alone a choice. BTW, I have stopped flying overseas because I fear a terrorist attack. Is 7.30 ABC going to have a report about my fears? Again please use facts before making unfounded points about what other countries would do. The only country I’m aware of that makes a western woman wear a head scarf (yes just a head scarf) is Iran. None of the Eastern Asian countries do, Saudi Arabia might, but getting a tourist visa there is difficult for a non muslim. Jordan, Syria and Lebanon don’t. Afghanistan and Iraq are war zones, but journalists certainly don’t seem to be wearing a scarf. The old russian stans don’t, Pakistan doesn’t, UAE, Oman, Egypt don’t. Not sure about Yemen, but again its a pretty unstable place. West African countries are also unlikely. What many countries do do is make you dress conservatively especially in and around religious sites. This applies to buddhist countries as much as muslim countries. The problem with fear is its often based on ignorance and hatred. I’m not saying everyone who has fear toweards muslims hates them, but the people making outlandish statements like Jacqui Lambie, probably do. Ever stop to think the fear and anti muslim propoganda, is actually making the chances of a terrorist attack more likely. Its the whole equal and opposite forces. The more you victimise people the more they fight back. even the guy being attacked in the military uniform was not true, and my many friends in the military said they ususally don’t wear their uniform on the way home, etc because there are far more anti-war hippies who would spit on them than muslims. Is it just me or am I the only one that doesn’t want to die by beheading. All the examples you cite there are not gender specific. There are only two countries in the world where a hijab is mandatory, and in one of those it is fairly loosely enforced. When we toured Iran a few years back my wife’s scarf kept slipping off her head because as a westerner she was not used to wearing it and really didn’t know how to put it on. Most people just laughed. If you visit you will notice most Iranian women only ‘just’ wear it with the majority of their hair exposed in what is just a token effort to comply with the law. No-one seems to care. Sensationalist media? In her interview, Nurcan Baran could not be specific about any threats she faced; it was ‘a look’ someone gave her, the ‘way she was treated’ at some government office. It was a shameless beat-up so typical of the ABC, hardly a newsworthy story at all except for the fact that she was willing to blame Abbott for the ‘threats’ she claimed to feel. Nailed it right there. I guarantee she does not speak for the majority of hijab wearing students at UC. ….. When we toured Iran a few years back my wife’s scarf kept slipping off her head because as a westerner she was not used to wearing it and really didn’t know how to put it on. Most people just laughed. If you visit you will notice most Iranian women only ‘just’ wear it with the majority of their hair exposed in what is just a token effort to comply with the law. No-one seems to care. From the way the ABC presented this issue, viewers would be forgiven for assuming that the problems faced by Muslims in this country are the fault of Tony Abbott, not the extremists. I certainly don’t fell threatened by Muslim Australians. But I am frightened by the fact that our national broadcaster appears to have abandoned even a pretence of objectivity. It is not the role of the ABC to act as a counter the Murdoch press, their job is to present news in an impartial manner. It is simply ridiculous to say that one will not fly international for fear of terrorism. That’s like saying you won’t go to the chemist for fear of ebola. That is a pathetic attempt to be analogous. I know you can do better than that. There is a report in today’s Canberra Times about ISIS being able to protect the explosives they have to be used in high technology devices to use against “civil aviation”. That is code for they are going to blow up airliners. No good reason? I thought the 2 Malaysian airliners that disappeared/shot down were the result of terrorist attacks. I must have missed something. Maybe we missed something? Do you have information we don’t? I didn’t know that MH370 was confirmed as being missing due to a terrorist attack. In fact, the last I heard, was that it was most likely NOT due to that at all (but yes, still possible). As for MH17, I guess it depends as to what you define as terrorist activity. It was over a warzone and accidentally shot down by Russian-backed rebels (pretty sure they aren’t Muslim). Meanwhile in Australia, another 300 people are murdered each year……. And 1200 die on our roads. No one knows what happened to MH370 but one theory is more credible than the current “crashed in the South Indian Ocean”. No one ever dreamed 9/11 could have happened and even the parents of the suicide pilots had no idea, so, what is put forward in the link and the who is making the claim should be sounding alarm bells. Remember, the leaders of Iran have repeatedly said the will “blow Israel off the map”. They probably have a H-Bomb by now and they may have a B777 to deliver it. I hope I am wrong but until some wreckage from the missing plane turns up my theory cannot be dismissed. MH17 was clearly shot down by a Russian missile fired by Ukrainian separatists who are also referred to as terrorists. You make the correct observation that it was shot down over a war-zone. The airline operators were naive for believing that it was not dangerous to fly that route. Since the emergence of ISIS, the world is now in a virtual war-zone so flying anywhere is unsafe. I will disregard your flippant comment about road deaths and murders in Australia but I will definitely stay indoors more. You have raised a good point concerning the misuse of registered names, particularly buy governments. While I am not an expert in these matters it would appear that if DMO wanted to they could tell Tony Abbott to find another name or arrange a license to use the name, for a fee. No good reason? I thought the 2 Malaysian airliners that disappeared/shot down were the result of terrorist attacks. I must have missed something. .
One was shot down by a Russian backed separatist group, more than likely by mistake, using Russian supplied weapons whilst flying over a war zone. Arguably the group are a terrorist group but the international community is treating it more as a war-crime than an act of terrorism. Of course that is semantics, but ‘terrorism’ is all about semantics. Murder is murder but it is the reason behind the act that makes something ‘terrorism’…not the actual act. The other airliner is missing and no-one knows what happened to it, but terrorism is very low on the list of reasons given by the countries (including Australia) involved in the investigation. Have you watched the news today? ISIS has beheaded another British hostage and stated that another American journalist will be next. Of course I have seen the news and I find this act repulsive and believe ISIS and its vile ideology should be wiped off the map, as do most of the world. That is why we and other nations are taking military action against this abhorrent terrorist group and I wholehearted support that action. As you are no doubt aware many ‘muslim nations’ are militarily involved and are actively flying airstrikes against ISIS. This is being done with the overwhelming support of their citizens as ISIS is a real threat to the surrounding muslim countries, their citizens, way of life and government. After all, ISIS have killed many more muslims than christians and are a direct threat to the people of the neighbouring countries. .
You are obviously being hosted by the 99% of good and decent Muslims wherever you are but me and lots of my colleagues have to deal with realities of the war that the other 1% are waging. Ah, ignorance is bliss. .
Happily back in Australia thanks. I have been visiting countries which are really at threat from that other 1% and are quite concerned about it. But I am not going to let those terrorists ruin my life. 1.5 million people die a year in traffic accidents, 2 million in work-place related accidents but I still drive to work every day. I am already planning our next overseas holiday. The latest plan is flying to Korea to see where my father served and visit the UN Cemetery to pay respects to some of the mates he served with. Then on to China and up to Mongolia. Any thoughts? Have you been there? And do you really believe that woman on 7.30 has fear based on real and likely incidents? In Canberra? She also said something about Canberra was giving her a negative feeling. The Australian media is saturated with reports at the moment of muslims, especially women, , being abused, assaulted and harassed on the streets, public transports, at home and at work. Even non-muslims foreigners who look a bit different are being harassed. It is being acknowleged as a problem by both the government and opposition. News Limited sent one of their journos out into Sydney just the other day in a burka as a test and she was abused and harassed. Yes, I believe her fears are well founded, even in Canberra. It was just another massive ABC beat up to attack Tony Abbott. Would it surprise you to know I am a lifelong conservative voter? I believe the current government are doing much better in almost every field than the previous debacle we had running the show. –	Have you ever really had dealings with a Muslim? I don’t mean just bought a kebab off someone, actually worked alongside someone for a long period, been to a BBQ with them, had someone on your sporting team, had someone around to your house for dinner etc? –	Have you ever visited one of the muslim countries you talk about? –	I agree that there are evil people, and there are evil people who use Islam as a shield and justification…but there are also people of every religion who do that…Do really believe one third of the worlds population are part of some organized terrorist group that want to do you personal harm? –	I also note you haven’t addressed the original premis of your post about hijabs being compulsory in Muslim countries? Thanks in advance for the discourse. Wow…that was a long post.